Paris, July 16 : France's 2018 FIFA World Cup champions arrived in Paris on Monday with their golden trophy in hand, after beating Croatia 4-2 in the final in Moscow. Les Blues are expected to head to a victory parade down the Champs Elysees avenue in an open-top bus, where hundreds of thousands of people have been waiting to celebrate France's second World Cup win, after their first victory in 1998 when they hosted the tournament, reports Efe. As the national squad's plane arrived, Charles de Gaulle airport's fire brigade gave a water jet salute. Minister of Sports Laura Flessel was on hand to welcome the team, with Les Bleus' captain Hugo Lloris the first to exit the plane holding the trophy, followed by coach Didier Deschamps and French soccer federation chairman Noel Le Graet. 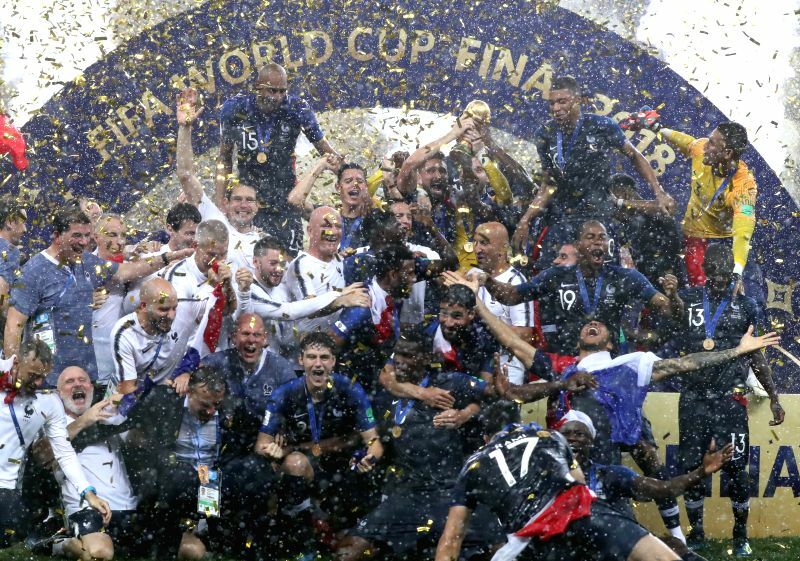 The players then headed on to a small stage for their first photo with the World Cup trophy on French soil, before being whisked inside to begin their triumphant tour of the city.